How do you get something to be shared and spread? The answer, unsurprisingly, is not “build it and they will come”. The answer is not a hashtag. The answer is that you need conversation density. Broadly defined, conversation density is the amount of conversational engagement happening in any given event, hashtag, or story. The more dense a conversation is with interactions, replies, and engagement, the more likely that conversation will lead to business later down the road. In an October 2013 study by Google and Forrester Consulting, socially engaged customers were 51% more likely to prefer a brand they engaged with versus non-engaged customers and 13.6% more likely to make a purchase. Here are two examples that illustrate conversation density. This is a visualization of a Twitter hashtag using SHIFT’s Conversation Density Map at a recent conference. 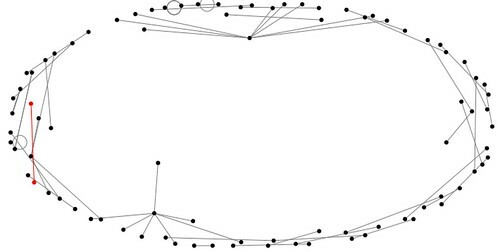 Each dot represents a Twitter reply to another handle. Twitter handles that did not reply to someone do not appear, even if they shared the hashtag. 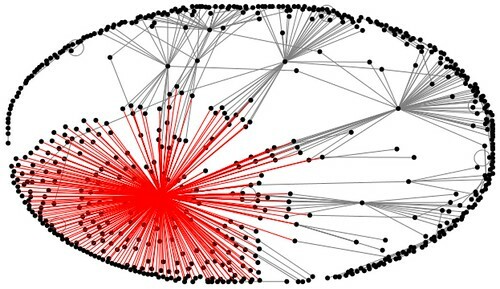 In the lower left we see the official conference handle (in red) as well as sets of influencers on the upper and right sides interacting with the hashtag as well. This is a strong, healthy conversation, one that you’d want to see at an event or in the wake of a positive news story. There are lots of people having conversations with each other, and lots of people interacting with the conference’s social media handle. Unsurprisingly, the event itself was rated by its attendees as successful and worth returning to. Let’s now look at the opposite of high conversation density, a conversation desert. Using the same software and visualization, this is a map of a recent national news story hashtag. Here we see that despite having nearly as many tweets, there’s almost no interaction between Twitter handles – the number of dots is significantly fewer. The conversation is much more passive; people didn’t have much to say to each other about this particular news story. With such low engagement, even though the story was broadly shared, it’s less likely to generate a positive business outcome. One of the keys to conversation density is that you must be a super-active participant in the conversation. You must foster it by actively engaging with as many people as practical for any given story, event, or hashtag. For example, suppose you get a great piece of coverage from an effective public relations campaign. Instead of just letting the coverage sit out there to be discovered through serendipity, actively promote it on your social channels. Reach out to your stable of friendly contacts and influencers and have a conversation about it. Encourage them as appropriate to share the story, and consider paid social media promotion to further engagement by promoting it to your fans and followers, then following up with conversational engagement. Conversation density is just one of the many metrics to keep an eye on in social media, but it’s an important way to gauge how engaged your audience is. Use this method of measuring the conversation density of your next social media campaign.